Who knew that so many restaurants in Oakland are closed on Sunday? Lucky for us, Pican is the exception. 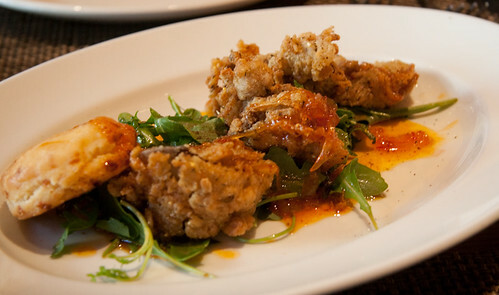 We sampled Southern Foie Gras - fried chicken livers with a nice bright slaw to counterbalance the crunchy fried goodness. Even Brett who normally doesn't prefer chicken livers, enjoyed them. Our second starter was Heirloom Tomato and Nectarine Panzanella another well dressed and balanced dish. Shrimp and Grits starter was also tasty, a few large shrimp and some very good grits. 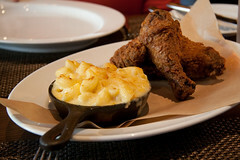 We moved on the Fried Chicken accompanied by a Mac n' Cheese. The fried chicken was well seasoned and delicious, with a thick crunchy crust. I think I prefer the slightly less thick crust at BSK, but I have plenty of room in my stomach for all styles of fried chicken! They brought us some of their house chili vinegar which was an innocent looking pale yellow vinegar with a hidden super punch of spicy chili. It was so good that we could not stop dipping pieces of chicken into it. The Mac n' Cheese was particularly good with the slight tang of the gouda cheese and a perfect sauce that was smooth and creamy without being overwhelmingly thick and cheesy. The Laquered Duck was excellent as were the light fluffy mashed potatoes. The decor and the atmosphere of Pican is upscale but not stuffy. The service was friendly and the courses well timed. We had a good view of the kitchen and it was very clear that it is a well run efficient operation. Dish after dish of picture perfect food coming out very quickly. It was nice to see so many people enjoying Sunday dinner in downtown Oakland. The menu is fairly large and I'll definitely return to try some more, definitely the ribs and a few more of the starters.